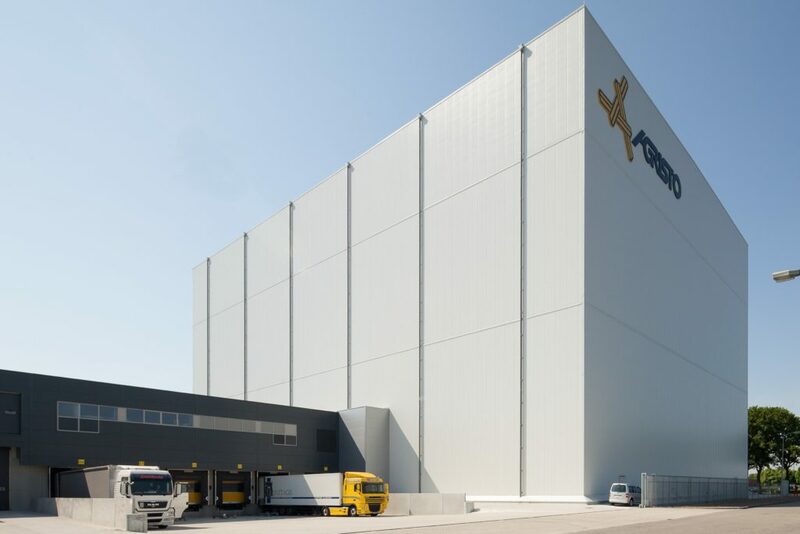 Agristo Nederland has been given permission to build the tallest automatic warehouse in the Benelux region in Tilburg. Kamplacon is installing the roof and façade cladding. Standing 40 metres high, 53 metres wide and with a corridor length of 78 metres, the warehouse will be able to hold in the region of 25,600 Europallets. The deep-freeze warehouse is being built in the form of a silo structure. This means that the pallet racks are being assembled first. Kamplacon will then install the roof and façade cladding. This deep-freeze warehouse requires a constant temperature of -26°C. To ensure fire safety, the oxygen content is being reduced to less than 18% through the addition of nitrogen. This means that a damp-proof construction is needed for the whole of the warehouse. For this project Kamplacon supplied products including 4,200 m2 of damp-proofing and insulation for the floor. A sandwich construction of the type Kingspan KS1100CS with a thickness of 200 mm was supplied in the same quantity to insulate the roof. We also supplied 4,200 m2 of additional PIR insulation and PVC roof cladding. The walls were clad with 11,500 m2 of a sandwich construction in the form of PIR sandwich panels of the type Kingspan KS1100CS. For this project Kamplacon is also providing permanent fall protection systems, rainwater drainage, deep-freeze doors and sliding doors.